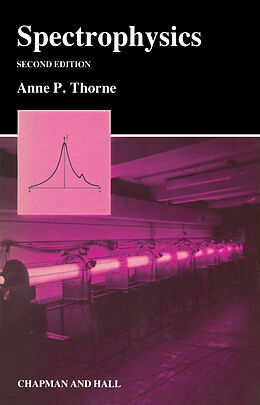 This book describes the methods of experimental spectroscopy and their use in the study of physical phenomena. The applications of optical spectroscopy may be grouped under three broad headings: chemical analysis, elucidation of atomic and molecular structure, and investigations of the interactions of radiating atoms and molecules with their environment. I have used the word &apos;Spectro physics&apos; for the third of these by analogy with spectrochemistry for the first and in preference to &apos;quantitative spectroscopy&apos;. A number of textbooks treat atomic and molecular structure at varying levels of profundity, but elementary spectrophysics is not, so far as I am aware, covered in anyone existing book. There is moreover a lack of up-to-date books on experimental techniques that treat in a fairly elementary fashion interfero metric, Fourier transform and radiofrequency methods as well as prism and grating spectroscopy. 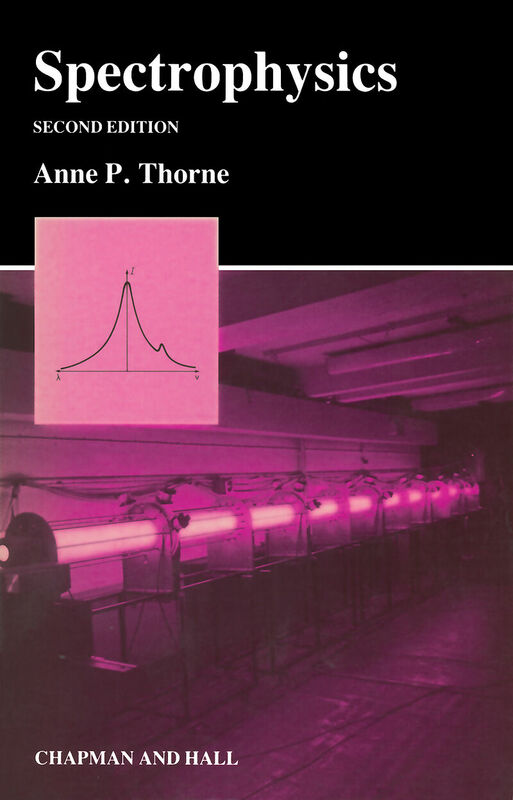 In view of the importance of spectrophysics in astrophys ics and plasma physics as well as in atomic and molecular spectroscopy there seemed a place for a book describing both the experimental methods and their spectrophysical applications. 1 Introduction.- 1.1 The uses of spectroscopy.- 1.2 Scope of this book.- 1.3 The electromagnetic spectrum.- 1.4 Term diagrams and line series.- 1.5 Sources, detectors and dispersers.- 1.6 Survey of spectral regions.- 1.7 Wavelength standards.- 1.8 Units used in this book.- References.- 2 A Summary of atomic structure.- 2.1 Schrödinger's equation: wave functions.- 2.2 The hydrogen atom: degeneracy and spin.- 2.3 The Pauli exclusion principle and shell structure.- 2.4 The central field model.- 2.5 Interlude: perturbation theory.- 2.6 Electrostatic interactions: the quantum numbers L and S.- 2.7 Magnetic interactions: the quantum numbers j and J.- 2.8 Radiative transitions and selection rules.- 2.9 Zeeman and Stark effects.- 2.10 Configuration interaction and auto-ionization.- 2.11 Hyperfine structure and isotope shift.- 2.12 Ionic spectra.- 2.13 Inner shell and X-ray spectra.- References.- 3 A summary of molecular structure.- 3.1 Interatomic potentials.- 3.2 The Born-Oppenheimer approximation.- 3.3 Electronic energy of diatomic molecules.- 3.4 Vibrational energy of diatomic molecules.- 3.5 Rotational energy of diatomic molecules.- 3.6 Spectra of diatomic molecules.- 3.7 Transition probabilities for diatomic molecules.- 3.8 Some further points on spectra of diatomic molecules.- 3.9 Remarks on polyatomic molecules.- References.- 4 Light sources and detectors.- 4.1 Definitions of light flux.- 4.2 Blackbody radiation and sources of continuum.- 4.3 Intensity standards.- 4.4 The excitation of line spectra.- 4.5 The Einstein probability coefficients.- 4.6 The different types of light source.- 4.7 Traditional sources: flames, arcs, sparks and glow discharges.- 4.8 Special sources.- 4.9 Absorption spectroscopy.- 4.10 General remarks on detectors.- 4.11 Detectors for the infra-red.- 4.12 Detectors for the visible and ultra-violet.- 4.13 Photographic emulsions.- 4.14 Array detectors.- References.- 5 Dispersion and resolving power: prism spectrographs.- 5.1 General remarks.- 5.2 Dispersion and resolving power.- 5.3 Slit width.- 5.4 Throughput and illumination.- 5.5 Prism instruments.- 5.6 Deviation and dispersion.- 5.7 Resolving power.- 5.8 Prism materials.- 5.9 Image defects.- 5.10 Merits of prism spectrometers.- References.- 6 Diffraction gratings.- 6.1 Plane grating: condition for maxima.- 6.2 Intensity distribution from ideal diffraction grating.- 6.3 Dispersion and resolving power.- 6.4 Concave gratings.- 6.5 Grating mountings.- 6.6 Production and characteristics of gratings.- 6.7 Gratings for special purposes.- References.- 7 Interferometers.- 7.1 Some basic concepts of interferometric spectroscopy.- 7.2 Resolution and throughput.- 7.3 Fabry-Perot interferometers: intensity distribution.- 7.4 Fabry-Perot interferometers: resolution and limitations.- 7.5 Fabry-Perot interferometers: methods of use.- 7.6 Michelson interferometers and Fourier transform spectroscopy.- 7.7 Fourier transform spectroscopy: instrument function, resolution, sampling and aliasing.- 7.8 Fourier transform spectroscopy: computing and control.- 7.9 Fourier transform versus grating spectroscopy: a comparison.- References.- 8 Laser spectroscopy.- 8.1 Introduction to lasers.- 8.2 Types of laser.- 8.3 Optical pumping and saturation.- 8.4 Spectral and temporal resolution.- 8.5 Laser absorption and excitation experiments.- 8.6 Doppler-free spectroscopy.- 8.7 High intensity effects, cooling and trapping.- References.- 9 Other spectroscopic methods: microwave, radiofrequency, level-crossing and Raman.- 9.1 Introduction.- 9.2 Microwave spectroscopy.- 9.3 Microwave spectroscopy of gases: the principal applications.- 9.4 Magnetic resonance spectroscopy: general considerations.- 9.5 Electron spin and nuclear magnetic resonance spectroscopy (ESR and NMR).- 9.6 Atomic and molecular beam magnetic resonance.- 9.7 Transitions in and information from beam magnetic resonance.- 9.8 Double resonance and optical pumping experiments.- 9.9 Level-crossing experiments.- 9.10 Raman spectroscopy.- 9.11 Coherent anti-Stokes Raman spectroscopy (CARS).- References.- 10 Width and shape of spectral lines.- 10.1 Line profiles.- 10.2 Natural broadening.- 10.3 Doppler broadening.- 10.4 Introduction to pressure broadening.- 10.5 Pressure broadening: types of perturbation.- 10.6 Pressure broadening: the impact approximation.- 10.7 Pressure broadening: the quasi-static approximation.- 10.8 Experimental aspects of pressure broadening.- 10.9 Convolution of line profiles: the Voigt profile.- References.- 11 Emission and absorption of line radiation.- 11.1 Introduction.- 11.2 Boltzmann distribution of population and state sum.- 11.3 Einstein coefficients and line strength.- 11.4 Absorption coefficient.- 11.5 Oscillator strength.- 11.6 The f-sum rule.- 11.7 Optical depth and equivalent width.- 11.8 Curve of growth.- 11.9 Emission lines; source function and radiative transfer.- 11.10 f-values in diatomic molecules.- References.- 12 Experimental determination of transition probabilities and radiative lifetimes.- 12.1 Introduction.- 12.2 Remarks on the calculation of transition probabilities.- 12.3 Emission measurements.- 12.4 Absorption and dispersion measurements.- 12.5 Lifetime measurements.- 12.6 Combinations of methods.- References.- 13 Elementary plasma spectroscopy.- 13.1 Introduction.- 13.2 Debye radius.- 13.3 Plasma oscillations.- 13.4 Energy distribution and dissociation equilibrium.- 13.5 Saha's equation for ionization equilibrium.- 13.6 Depression of ionization potential and Inglis-Teller limit.- 13.7 Electron collisional rates.- 13.8 Local thermodynamic equilibrium.- 13.9 Coronal equilibrium and ionization equilibrium.- 13.10 Continuous emission and absorption.- 13.11 The continuous absorption cross-section.- 13.12 The continuous emission.- 13.13 Other continua.- 13.14 Applications of plasma spectroscopy.- 13.15 Spectroscopic measurement of temperature.- 13.16 Spectroscopic determination of electron density.- References.